Navigation helping devices for the visually impaired span all levels of technology, affordability and feasibility. The Blind Guider concept from designers Jang Cheng, Hui-Chuan Ma, Chih-Hao Wang and Yin-Kai Li is high on functionality and technology, but scores a little lower on the scale of possibility. The system consists of guide bricks with RFID chips embedded which communicate with sensors on the bottom of the guide cane. 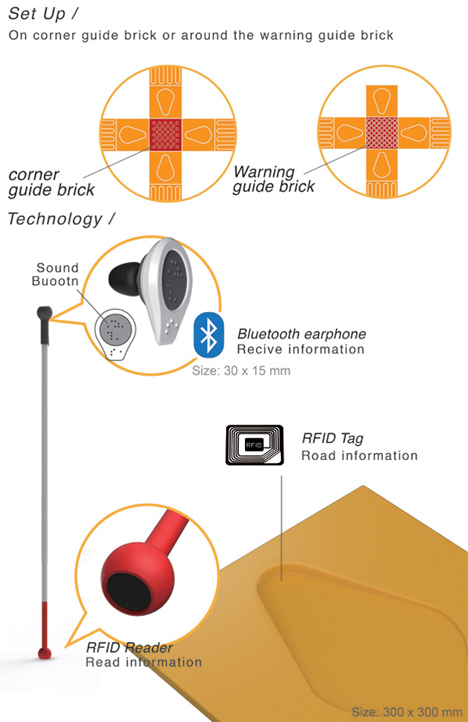 When a visually impaired person is walking along a sidewalk and approaches one of the guide bricks, the RFID tag inside the brick interacts with the guide cane to identify the street on which the walker stands. The information is sent to the wireless earpiece worn by the user, telling that person exactly where they are. 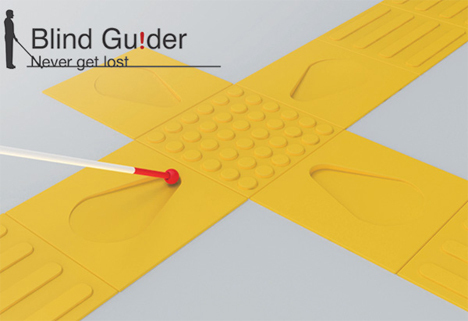 The user can then move the cane around to other parts of the guide brick in order to navigate to their destination. 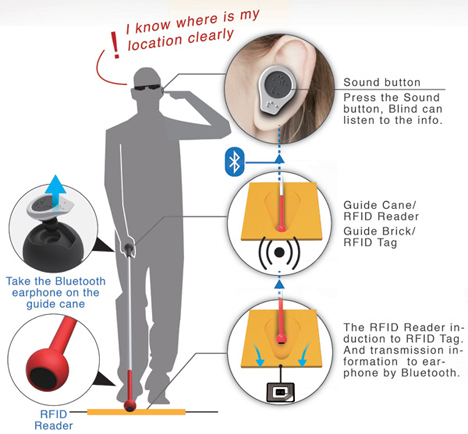 When the cane is not in use, the Bluetooth earpiece fits neatly into the top of the cane. The concept definitely seems useful, but in order for the system to be put into place it would have to be installed in a widespread area, such as an entire city. The infrastructure changes required to implement the Blind Guider system would be expensive and, unfortunately, probably deemed an unsuitable public works project. As a concept meant to help people, however, the Blind Guider is about as creative as it gets.